For a long time, neo-classical economics has been the economic orthodoxy. Neo-classical economics is a patchwork of theories all with a general aim of demonstrating how production and distribution takes place under mediation of supply and demand. The theory came to prominence in the late 1800s, displacing the previous classical economics, a research programme which was initiated by Adam Smith most famously in his great work, “The Wealth of Nations”. This programme was continued by David Ricardo in Principles of Political Economy and Taxation among other works, and later by none other than Karl Marx in his seminal work Das Kapital. Marx made deeply important contributions to classical economic research. In fact his contributions were so important that they poisoned the well of classical economic theory completely, leaving no room for more conservative theorists to wiggle out of the implications which are brought forward in Das Kapital. To put the central problematic in a nutshell, there was an unresolvable antagonism between wage labourers and capital over value. Yet despite the importance of his additions, Marx’s theories are firmly rooted in the tradition of classical political economy. The growth of the neo-classical programme can be seen as a direct response to this conundrum. Continuing with the classical programme looked futile for those interested in claiming that capital was due a share of the proceeds of sale, and that labour was already being given what was its right. And so the classical programme has been in decreasing importance for over 100 years. 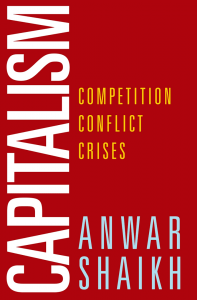 In his latest book, Capitalism: Competition, Conflict, Crises, Anwar Shaikh has taken on the absolutely mammoth task of reanimating classical political economy. The book is the result of 15 years worth of work both writing, researching and evaluating empirical evidence. Though the task might sound futile in its enormity, Anwar Shaikh’s book is a real contender. The book is gigantic at 761 pages, or 900 if you include the appendices, which give more detailed mathematics and data on some of the arguments. I confess, that though I spent a week in the Alps without internet access, I was only able to closely read some 465 pages, skimming the rest and reading the conclusion. However, what I found was well worth the slog. I’ll try to put down what I thought were the highlights, only developing a handful of the many elements of the book. Maybe, if you’re more adventurous than me, you’ll forge through the entire tome, and if not, at least you’ll know you can look up the chapter that is of interest to you. The book serves several purposes, and as such Anwar develops each topic approximately in the following way (though not necessarily in the following order). The first is a critique of the current neo-classical approach to economics and why it is found wanting in the study of some topic. The second is a survey of the literature and approaches taken to these questions usually by neo-classicals, Keynesians, Post-Keynesians, those in the Sraffian tradition, and anyone else who happens to be relevant (for instance Von Neumann’s independent work is mentioned). The third is the demonstration of the classical approach to the question. The fourth is empirical data which demonstrates the strength of the classical approach. This methodology satisfies the reasoning for eschewing the neo-classical approach, and provides evidence that the classical approach is enlightening. The broad thesis of the book revolves around the idea of “real competition”. This concept essentially originates in Adam Smith but gets a much more detailed description by Marx. We should understand the production process as composed by a number of firms. Each firm tries to maximise the sale price relative to the costs of its production. The costs are comprised of input commodities and wage labour. Several firms will compete to produce commodities in the same sphere. If a firm is selling at a very high price, other firms will set their prices lower and attempt to eat up market share and sell in larger volumes, driving the price downward. When the price is too low, the profit rate is depressed and fewer investors attempt to increase productive capacity or firms go out of business and the price recovers. The eventual price is the result of each firm guessing what the highest price they can get on the market subject to their competition. Anwar’s work hopes to demonstrate that the structure of this price is based on these factors, leading, not to equilibrium, but what he terms turbulent gravitation. This is again, in the spirit of Marx, where prices gravitate around values, but are in constant motion and that price structure does not converge to anything, but instead dances around some gravitational centre according to the constraints. This agent-based evolutionary approach to modeling capitalism sounds very intuitive. In fact it’s largely what Adam Smith had already described in The Wealth of Nations. Further, it’s close to the way that business studies has approached the question, since businesses are quite interested in how they should set their prices in the absence of the market converging to the correct price of its own accord. As Shaikh shows in his book, surveys of industry leaders find that this story is essentially how they understand their own behaviour as they conduct price setting in actual practice. It might then come as some surprise to those who are not steeped in the stew of neo-classical economics that this is far from the way that modern economics understands the process. The orthodox neo-classicals, the Keynesians, the Kaleckians and the post-Keyensians all start from a totally different standpoint known as “perfect competition”, or a close relative, “imperfect competition”. In none of these are prices determined by the cost-cutting warfare of competing producers. Milton Friedman’s most famous response to the criticism that the structure of neo-classical theories was demonstrably totally at odds with the real practice of the firm stated that: “assumptions don’t matter”, his point being that only predictions do. From this argument, we see that Friedman is clearly aware of how unrealistic the models of neo-classical economics really are. In real competition, firms set prices in light of market conditions and competitive consequences, cutting these prices in order to gain an advantage over their existing competitors and to keep potential ones at bay. Except for distress sales, price cuts are ultimately limited by costs. However, luring more customers to your door with lower prices is of little benefit unless you can increase your normal level of production. The advantage therefore resides in the lowest cost reproducible conditions of production (i.e. in regulating conditions). We will look at regulating conditions in more detail later. Neo-classical economics includes individual consumers and their preferences as a core part of its argument. Individuals are asserted to make choices about how much they favour one good as compared to another. All of these choices, pair-wise between every two goods can be assembled into a utility function. A single slice of this utility function on which any two goods can be exchanged with “indifference” according to the consumer is called an indifference curve. The neo-classisist then tells us that these can be aggregated into a representative agent with a similar utility function. There are a whole host of technical problems with this theory, and Anwar points out most of them so I will not bother to go through too much detail. Suffice it to say that it’s implausible that individuals have any such complex of goods of indifference in their heads, and behavioural economics supports the idea that they do not, but also that even if they did, one could not in a mathematically plausible way arrive at an aggregate utility function with the kinds of properties which would mimic a “representative agent” without some unmotivated mathematical side-conditions. However, most importantly, classical economics has long suggested that price doesn’t really care much about individual preferences anyhow. So not only is the theory implausible empirically and mathematically, but it wouldn’t matter even if it were true if, in fact, the classical economists are right. Anwar Shaikh proceeds to demonstrate how agents with constrained budgets already yield a situation which is robustly “indifferent” to this “indifference curve” scenario. The consumer, far from impacting the price structure in any deep way, can only increase what price they are willing to pay within the constraint of income, potentially leading to price increases by producers and subsequently changes in investment which increase supply and tend to move the price back towards costs of production again. It is a diversion of the price, rather than a change in structure. The cost structure of production is still driven by wages, input costs and normal profits. It’s perhaps worth noting that this is also in contrast to some Marxist theories such as those expressed by Michael Heinrich in An Introduction to the Three Volumes of Karl Marx’s Capital. His reading appears to claim that the consumer impresses itself deeply on the price structure by varying the conditions of production. If we accept the more classical interpretation however, this has important repercussions on how we should understand the economy. Take for instance the situation of rent in Dublin. Currently rents are very high indeed. There is clearly a supply problem (as of August 2016) as Daft.ie reports some 40 properties for the North Side in total. Rents are indeed very high, and have gone up a tremendous amount. However, they are not unbounded since they will only be rented if someone can afford to pay the bill. People will simply fail to pay for a good if it exceeds their income – all demands are truncated within the scope of what we can afford. At the same time, the cost of building new properties must include the land, the build costs, assorted tax, levies, advertisement, infrastructure and the profit rate. The profit rate is critically important here. Capitalists will not loan money to a builder who will not pay them back. Similarly a builder will not take on building property out of the goodness of their heart but must find that they get a profit rate (usually between 10 and 20%). So even though demand might be tremendously high subjectively as we talk to lots of people with housing needs, the producer only cares about costs of production and expected profit, and could not give a wit about the utility to a consumer. As soon as builders are assured they can realise the profits and the financiers are assured their interest rates, relative to the perceived risk of the projects, supply will increase, but not before. Arguably Marx’s most important contribution to political economy is in describing the relationship between the working class and the capitalist class in the relations of production. In this vision the amount of labour performed by the worker, and the remuneration they receive for that labour is seen as changeable and in accordance with relative institutional powers – the organisation of the workers relative the employers – as well as other external factors such as the supply of labour. It is seen as a central aspect which must be investigated if we hope to understand the economy. That employers struggle to intensify and extend the working day is plainly clear to anyone who has worked at wage labour, but somehow economists have done an excellent job of removing it from the equation! Anwar devotes a significant section of the book to looking at this relationship, empirical evidence of the relationship and presenting implications to marginalist approaches. Marginalism simply doesn’t make much sense when presented with the real facts of production processes in actual industries. However, Ricardo’s original reason for introducing diminishing returns to marginal production, before it was seized on by neo-classicals leads us neatly into the next subject. Perhaps one of the most interesting parts of the book is on the theory of regulating conditions and regulating capitals. Shaikh intimates that this notion was introduced by Ricardo, and extended and remarked on later by Marx. In an example due to Marx, we are given a scenario in which we produce a commodity (perhaps a woven linen cloth) which makes use of two different sources of power. The first utilises a water-wheel, the second uses coal. The cost of production making use by the water-wheel is lower than the cost of production utilising the coal, as the water flows by naturally and the only cost of power acquisition is in depreciation of the wheel. However, this is a very geographically situated and limited power source that not all producers can avail of. The consequence of this is that when demand increases for finished linen products, after the water-wheel is at productive capacity additional producers must do so utilising coal. Each new unit will then require investment in coal production. Since coal production is more expensive, this will not occur until demand causes an increase in the price of linen up until investors see some return approaching the normal profit rate. The normal profit rate is required as no investor is going to sink money into something which obtains a smaller profit than some other industry. Hence in determining the price structure of linen, the normal profit rate is added to the coal cost of production and not the water-wheel cost of production! This argument is similar to the one made by Ricardo regarding fertile land, and the consequences of increasing supply by utilising less fertile land “at the margins” which sets a similar price structure. In both cases, it is the highest cost of production which sets the price. Such a regulating profit rate does not drive all producers to obtain the normal profit rate. Instead, some producers in this scenario will obtain persistently higher profit rates. Shaikh shows that a range of different regulating capital scenarios occur in practice ranging from the regulating capital being the highest cost, to those in which it is the lowest cost and some in between. To see a case in which it is the lowest cost of production, we can look at industries in which newer technologies undercut production costs. In this scenario the older methods of production are still technically viable, but each new added unit costs less than those produced by older capital. Therefore the price leaders will be those in the newer introduced capitals, leading to older firms having persistently lower profit rates, or indeed requiring them to liquidate if they should end up with negative profit rates. The Labour Theory of value has been much derided by neoclassical economists. Generally undergraduates in economics are not given a very faithful rendering of the arguments, but instead are given some story about mud-pies or precious artworks or some other rather unusual limiting case (this was certainly the case for me). The classical theory of relative prices is a highly structured argument. The average market price of a sector fluctuates around the regulating price of production. New regulating capitals with their lower unit costs make room for themselves in the market by cutting prices, and existing capitals respond by lowering their own prices enough to at least slow down the inevitable erosion of their market shares.Hence at any one moment there is always a spectrum of selling prices correlated with the corresponding spectrum of costs. Relative sectoral prices then drift up or down primarily in response to the corresponding drift in relative sectoral costs. Ricardo was the first to establish the relative prices of production differ in a systematic manner from relatie total labor times. Yet he also famously argued that these differences are quite limited, being on the order of 7%. In a nutshell, labour values will not be the exact gravitation centre of prices, yet they also will not be too far off of them. The difference between the two should be systematically different by a factor related to the (integrated) profit/wage ratio. In effect, the ancillary prediction is that movements in relative prices are dominated by movements in labour time. …in cross sectional data, actual market prices are remarkably close to direct prices. In addition he continues to look at the evidence from time-series analysis to see if indeed labour times dominate changes in relative price and asserts that the data responds in the affirmative. No serious economic theory can exist without having some model of money suitable for use in a modern economy, although this hasn’t stopped monetarists from trying. In Smith, Ricardo, and Marx’s time all serious currencies were metal based – either being composed of, or requiring the exchange of, some precious metal. Consequently, fiat currencies were simply not dealt with by classical political economy. Marx despite living in an era of metalism, did not accept the quantity theory of money, at least not in his later works. His argument for rejecting it was empirical. During the 1848-1855 Gold Rush the quantity of gold on the market increased rapidly, and consequently so did prices in gold terms. However, prices did not rise as fast as the supply as the total economic activity in the market grew even faster. Previously idle labour and other capital capacities were absorbed. This lead Marx to posit that the velocity of money must also be important and, indeed, variable. This made any quantity theory of money untenable. Shaikh demonstrates just how important the change to fiat currency has been. While prices remained largely stable for over 100 years, the introduction of fiat currency lead to a massive increase in inflation. Fiat money potentially frees the state from its budget constraint. It successfully fueled the American, French, Chinese and other revolutions. And it led to the failures of the corresponding national currencies. The latter events and their modern counterparts have left a deep impression on monetary theory and practice. As a result, the Treasuries of most advanced countries are now inhibited from creating money to finance the excess of their desired expenditures over incoming tax and borrowing revenues. It appears that Anwar takes an endogenous money theory which is profit lead: new profit opportunities increase loans, and thereby the supply of money. However, the maximum rate of growth of this system is limited by real constraints on output growth and depends on the structure of production, something often missing in Keyensian and Modern Money Theory accounts. Finance is one of the great missing pieces of classical accounts of economics. The stock market and finance in general were important by the time Marx wrote capital, even if they were a vastly smaller fraction of the economy than they are today. Unfortunately Marx died prior to completing his planned work on finance and as such he left a hole which has not yet been adequately filled. Competition within an industry leads to roughly similar prices for a given type of commodity. Competition between industries leads to production prices that yield roughly similar profit rates for the regulating capitals of each industry. The same processes operate for the interest rate: competition within the financial sector equalizes interest rates for a given type of instrument, and competition across sectors establishes a level of the interest rate that yields a normal rate of profit for the financial regulating capitals In this regard, it is useful to begin with the oldest financial instrument, which is a bank loan. In order to show that this is indeed the case, Shaikh provides a graph (10.1) of the incremental rates of profit relative to the profit rate for all industries. However, it seems that the graph is only vaguely suggestive, and indeed looks as if the direction of motion is anti-correlated if anything. This classical approach is also able to explain a well known empirical conundrum in which bond rate of returns will tend to be below the equity rate of return which is sometimes known as the “equity premium puzzle”. Perhaps the greatest conundrum in classical political economy is generally known as the transformation problem. This is widely accepted as a serious problem for the labour theory of value, especially as it is presented by Marx. The basic idea is that Marx wants to, using prices of production, relate the total profit rate to the total aggregate surplus value. Unfortunately attempting to form a direct equivalence between these two leads to an inconsistency. Shaikh lays the blame of this apparent inconsistency on transfers. The concept of transfers originates with Sir James Steuart who identifies “positive profit” and “relative profit”. Positive profit, implies no loss to anybody; it results from the augmentation of labour, industry, or ingenuity, and has the effect of swelling or augmenting the public good… Relative profit, is what implies a loss to som Cebody; it marks a vibration of the balance of wealth between parties, but it implies no addition to the general stock… the compoud [is]…that species of profit…which is partly relative, and partly positive…both kinds may subsist inseparably in the same transaction. Marx re-terms these “profit on alienation” and “profit on production of surplus value”. Shaikh demonstrates how changes in relative prices can shift apparent profits by moving things around between the circuit of capital and the circuit of revenue. He gives a number of numerical examples and then claims that it is a general feature of all theories of price. In addition to the highlights provided above, there are a large number of interesting observations, many of them about different schools of thought in economics. One thing that struck me in particular was in reference to the “Cambridge capital controversy”. This controversy between those defending neo-classical approaches and those who believed that there was a fundamental inconsistency in the way in which capital was treated was resolved but in a way perhaps unsatisfactorily for both schools. Those attacking the neo-classical approach demonstrated that “reswitching” can occur. “Reswitching” refers to the fact that there is no simple monotonic relationship between production method and the profit rate. Essentially the idea is that, for instance, reducing the interest rate could make a production technique move from feasible to infeasible and then again to feasible. This makes reference to capital in concrete physical terms difficult because its value itself depends on the profit rates, a complicated circularity that is hard for neo-classical theories to accommodate. The anti-neo-classicals won the battle, but lost the war. They conceded the fact (as it is a mathematical truth) but claimed that it didn’t really matter in practice. Shaik looks at both the history of this problem and the more the modern literature. Perhaps surprisingly to those of us who would have been very happy at the disruption to the neo-classical programme caused by reswitching, Shaikh contends that more recent investigations show that it is not a serious problem. Instead, the conditions which lead to reswitching appear to be rare, and difficult to construct, though they are of course technically possible. There are few who would take on a project as enormous as rejuvenating classical political economy with a work ranging from mathematical developments through empirical verification. However, Shaikh has not only taken up the task but made a remarkable and convincing stab at it. This book should serve as an excellent starting point for further elaborations and investigations in classical political economy; a launching point for a programme to put labour and workers back at the centre of investigations of economics.